I always loved sewing. During the war, when we were refugees in Vichodnitza, there was no schooling. Instead, my mother kept me occupied with sewing. I enjoyed it greatly even though needles were scarce and I had to improvise by making needles out of iron wire. 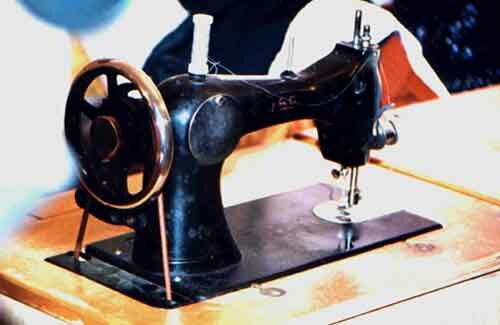 Sewing was known to provide a good income for women. All that a tailor had to do was to hire several "Shikses" (young gentile women) as aides, and set up an independent "Tish" (table) or business. Being aware of my limited options, I decided to study sewing. I was 12 years old. My mother and I made a verbal agreement with a tailor about an apprenticeship. The tailor was paid $25 for tuition, and I worked one year for her. In that first year I learned how to use the sewing machine and do some final touch work. In the second year I began to earn money. At this time I was already allowed to prepare garments for fitting. But I did not handle any business matters with the clients. Up to this time my social life was quite bleak. At school I had no friends my age because of the wide range in ages at each grade level. For example, I was studying in first grade with a 16 year old girl. What could we have in common? After all she was dating the teacher at night. In addition the children at that time did not have much free time for social activities because they were too busy helping their families with the daily struggle for survival. There were no youth groups. My social life could be summed up in mingling at the local market on Wednesdays. The apprentices (all girls) at the tailor's worked long hours. We used to tell stories while working. The main storytellers were two girls. One was married and the other had a boyfriend who broke-up with her. The tailor had many clients including some from Pushtza, a nearby Polish village. This kept us very busy. Across the wall from us there was a shoe shop belonging to Mordechai, the father of Uri Velvel. He had three experienced shoemakers working for him producing boots. He used to travel from fair to fair selling the boots. The wall was thin and we used to converse with the shoemakers as if there were no wall. We talked about work, love, finances and what not… We became friends, and it made work fun. In my second year I decided to save some money and go to study in Vilna.